Mr. Solow’s repertoire encompasses performances of more than 40 solo works with orchestras including the Los Angeles Philharmonic (also at the Hollywood Bowl), Japan Philharmonic, Prime Symphony (Korea), VNOB (Hanoi), Seattle Symphony, Milwaukee Symphony, Los Angeles Chamber Orchestra, and the American Symphony (with whom he also recorded), and he has been guest artist at many national and international chamber music festivals. He has recorded on the Columbia, New World, ABC, Centaur, Delos, Kleos, Laurel, Everest, and Telefunken labels and received two Grammy Award nominations. In addition to performing, Mr. Solow’s editions are published by Breitkopf, IMC, Peters, Latham, Ovation, and Henle Urtext, and his articles and reviews can be found in The Strad, Strings, and American String Teacher magazines. 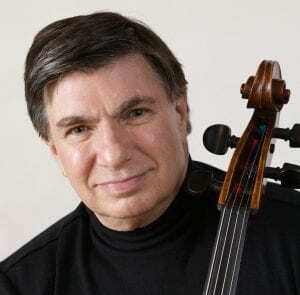 He is editor of the Newsletter of the Violoncello Society, Inc. of New York, the nation’s second oldest cello society, and serves as VCS president. Recognized as an authority on healthy and efficient cello playing, Jeffrey Solow is professor of cello at Temple University in Philadelphia. He is past president of the American String Teachers Association, chair of ASTA’s National Solo Competition, and has served on their Executive Board.